Barbie's older sister Cinderella never lets Barbie in her room. That upsets Barbie very much and makes her wish to enter her sister’s room even more. This room must be full of wonderful mysteries! Today is Barbie’s lucky day: Cinderella went to a party with her bffs and she’s not coming back until midnight. Help Barbie to finally sneak into Cinderella’s room and find out what she is hiding. Together with Barbie you can read her sister’s secret diary, try on her fashionable outfits and look! Seems like Cinderella forgot her iphone with all the pictures and messages! What a luck! Have a great time discovering Cinderella’s secrets, just watch the clock, or you will be caught! 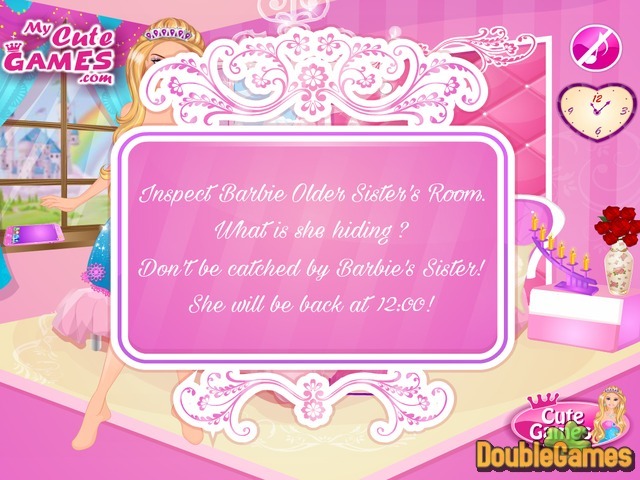 Title - Barbie's Older Sister Room Online Game Description - Relish Barbie's Older Sister Room, a Time Management game created by My Cute Games. Have fun discovering Cinderella’s secrets, just watch the clock or you will be caught.